DraftKings and FanDuel have each agreed to pay $6 million to the state of New York to settle allegations of false and deceptive advertising, clearing the final legal hurdle in an almost yearlong dispute with authorities in one of the most lucrative states for the online daily fantasy sports industry. The settlements announced Tuesday mark the highest penalties for deceptive advertising in New York “in recent memory,” according to a statement from the state attorney general’s office. But, for the heavily funded software companies, it’s a relatively small price to pay to move forward with their New York operations and turn their attention to ensuring their survival in other states. In August, New York became the eighth state this year to pass daily fantasy sports legislation. The law paved the way for Boston-based DraftKings and New York-based FanDuel to resume operations in the state (just in time for the start of the NFL season). The companies’ websites allow users to pay a fee to play short-term fantasy contests against millions of opponents and potentially win large sums of money. Users draft a lineup of players and earn points based on how well those players perform. 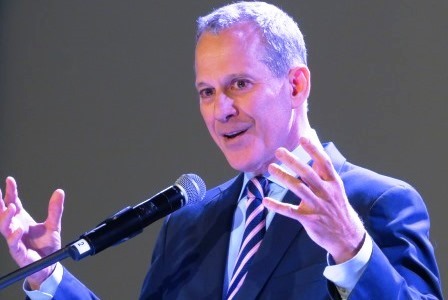 The companies’ legal trouble in New York began in November 2015, when New York Attorney General Eric Schneiderman (pictured above) sent a cease-and-desist letter claiming daily fantasy sports companies were running illegal gambling operations and should shut down immediately. DraftKings and FanDuel responded by suing Schneiderman and the state of New York. After some back-and-forth in court, the companies agreed in March to stop operating in the state as part of a deal with Schneiderman that effectively served as a temporary ceasefire, with the attorney general asking a state appellate court to delay hearing the case until this fall. The companies seemed to be betting that the New York legislature would in the meantime pass a bill authorizing their operations, which it did. But the agreement between Schneiderman and the companies did not apply to the deceptive advertising allegations. As part of the settlement of those claims, DraftKings and FanDuel agreed to several changes to their marketing practices. Those include clearly disclosing terms and conditions of “marketing promotions, expected winnings, and expected performance” in online contests, as well as providing resources for players deemed at risk of “compulsive gaming disorders, including addiction,” according to a press release from Schneiderman’s office. The companies must also maintain a website that lists users’ success rates, including what percentage of prize money is won by the top players. To read the full settlements, click here for FanDuel and here for DraftKings.